Lucy Waring, a young actress who is “resting” after the play she was in folded, accepts the invitation of her three-years-older sister Phyllida Forli, wife of a Roman banker, to join her at the family villa on Corfu, the Greek island rumored to be the island on which Prospero and his daughter Miranda take refuge in Shakespeare’s The Tempest. Phyllida, heavily pregnant with her third child, is delighted to have Lucy’s company, and Lucy, although disappointed that her first London role ended so soon, is enjoying time with her sister and the beauty of the island. She is intrigued when Phyllida tells her that the Forlis’ tenant at the Castello dei Fiori, the ancestral castle of Phyllida’s in-laws, is none other than the legendary British actor, Sir Julian Gale, who has ties to the island. Lucy’s first encounter with a Gale is not with Sir Julian but with his son Max, a well-known composer. They meet when someone shoots at a dolphin who has first terrified and then delighted Lucy during a solo swim in the bay. Lucy confronts Max when she sees him in the shadow of the pines above the bay, thinking he is the gunman. He denies her charge, questions her veracity, and rudely suggests that she leave the way she came. It’s no surprise that she sees him as totally lacking in the charm his father exudes. The episode with the dolphin is soon overshadowed by the presumed death of Spiro, twin brother of Miranda, Phyllida’s maid. According to the account of Godfrey Manning, the English author/photographer who employed the young man as an assistant and model, Spiro was washed overboard during a night-photography boat trip. When Lucy discovers a drowned body, she thinks it is Spiro’s, but when it turns out to be a shady local who is believed to be involved in a smuggling operation. Lucy feels sympathy for Godfrey, but her feelings for Max remain mixed until a midnight seaside meeting involving saving a beached dolphin and finding a lost diamond leads to a kiss that changes everything. Once it is clear that Max is the hero, the mystery moves at a rapid pace to its conclusion, but not before an unexpected swim, a scary motorcycle ride, and Shakespeare-worthy lines shock Lucy and the reader. If you follow romance writers and readers on social media, you probably read some of the gleeful posts last fall when Mary Stewart’s many fans in the community exulted over their one-click purchases of Stewart’s books at long last available in digital format for American readers—and at bargain prices. I was one of those posting. Perhaps you were too. Stewart (1916-2014), credited as the founder of modern romantic suspense, holds a spot in the history of romance fiction that is equaled only by Georgette Heyer. She was not only immensely popular, but she was also a major influence on two generations of writers. Simon in My Brother Michael was among the first beta heroes with whom I fell in love, I date my fondness for the reunited lovers trope to my investment in Gianetta and Nicholas Drury in Wildfire at Midnight, but This Rough Magic was the one I pulled off the shelf to reread most often. It epitomizes for me all the things I love in Mary Stewart’s books. The bay was deserted and very quiet. To either side of it the wooded promontories thrust out into the calm, glittering water. Beyond them the sea deepened through peacock shades to a rich, dark blue, where the mountains of Epirus floated in the clear distance, less substantial than a bank of mist. The far snows of Albania seemed to drift like clouds. For the second time that night I felt myself gripped, and roughly silenced, but this time by his mouth. It was cold, and tasted of salt, and the kiss seemed to last forever. We were both soaked to the skin, and chilled, but where our bodies met and clung I could feel the quick heat of his skin and the blood beating warm against mine. We might as well have been naked. 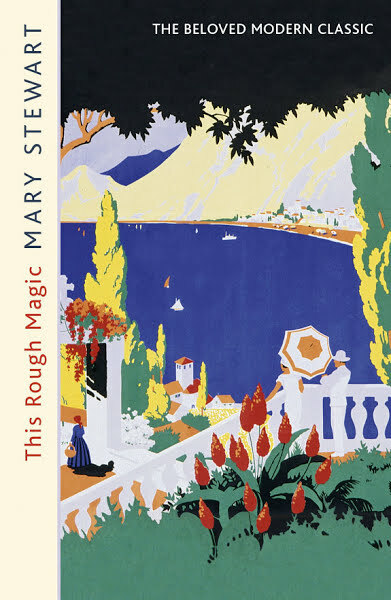 If you haven’t read Mary Stewart, you really should give her a try. If you have but it has been a while, download your favorite (Prices are still low), and settle in for a wonderful reread. I assure you the Stewart magic has not faded. If you were one of the one-clickers like me, how many did you buy? (Fourteen for me.) What’s your favorite? The Arthurian saga was my introduction to Mary Stuart's writing, read many years ago as a student in London, and still the best telling of Merlin's magic, in my opinion. I'm currently reading 'The Moon Spinners', set in Crete, just round the coast from Heraklion. It so happens that I spent a week in that area some years ago (mainly for a physics conf) and the book just evokes the magic of the island for me. No murders while I was there, though a couple of conf participants did induce thoughts along those lines! Thanks for the brilliant review Janga ... I rely a great deal on your guidance when navigating the vast ocean of romantic tales. Just downloaded 'Rough Magic' and 'Wildfire at Midnight'. I notice that a couple of Stuart's books have made it to audio, but only in abridged form ... grrrrr! Q, I love the Arthurian books too, although I came to them later and have not reread them as frequently as I have Stewart's romantic suspense. Thank you for your kind words about this review and your confidence in my reviews generally. You made me smile on a day when I am battling a writing assignment that has me at the hair-pulling stage. :) I know you prefer audio, so I will wish along with you that more Stewart books will soon be available in that format. Mary Stewart was one of the first authors I discovered after moving from the children's section to the adult shelves at my childhood public library. It was her books that launched my love of the present-day romantic suspense stories that keep me on the edge of my seat, reading way past my bedtime. It's been years since I read Stewart's books but, as a young woman, my favorites were Wildfire at Midnight, The Moon-Spinners, The Ivy Tree...oh, let's face it...I loved them all! So did I, PJ. Someone did an interview with a group of romance authors several years ago asking about writers who had influenced them. Georgette Heyer and Mary Stewart were the names that came up most often. I suspect the results would be different with younger authors, but their influence lives on, even if indirectly. I have a shelf of Mary Stewart books. I started looking for them after I realized she wrote THE MOON-SPINNERS. I saw the Disney movie based on the book when I was much younger. It was the first suspense and "romance" I had seen and I loved it. I realize the movie varied from the book and was adjusted for a young audience. But in 1964 it was quite a new and exciting experience, a big change from other movies for the age level. Hopefully, I will be able to get to all those Mary Stewart books soon.